The effects of passionflower tend to be milder than other herbs used to treat anxiety including valerian (Valeriana officinalis) and kava (Piper methysticum). Passionflower is often combined with valerian, lemon balm (Melissa officinalis), or other calming herbs. Few scientific studies have tested passionflower as a treatment for anxiety or insomnia, however. Because passionflower is often combined with other calming herbs, it is difficult to tell what effects passionflower has on its own. Studies of people with generalized anxiety disorder show that passionflower is as effective as the drug oxazepam (Serax) for treating symptoms. Passionflower didn't work as quickly as oxazepam (day 7 compared to day 4). However, it produced less impairment on job performance than oxazepam. Other studies show that patients who were given passionflower before surgery had less anxiety than those given a placebo, but they recovered from anesthesia just as quickly. Native to southeastern parts of the Americas, passionflower is now grown throughout Europe. It is a perennial climbing vine with herbaceous shoots and a sturdy woody stem that grows to a length of nearly 10 meters (about 32 feet). Each flower has 5 white petals and 5 sepals that vary in color from magenta to blue. According to folklore, passionflower got its name because its corona resembles the crown of thorns worn by Jesus during the crucifixion. The passionflower's ripe fruit is an egg-shaped berry that may be yellow or purple. Some kinds of passionfruit are edible. 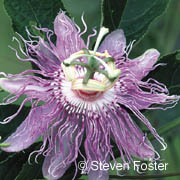 The above-ground parts (flowers, leaves, and stems) of the passionflower are used for medicinal purposes. No studies have examined the effects of passionflower in children, so DO NOT give passionflower to a child without a doctor's supervision. Adjust the recommended adult dose to account for the child's weight. Speak to your doctor for specific recommendations for your condition. DO NOT take passionflower if you are pregnant or breastfeeding. For others, passionflower is generally considered to be safe and nontoxic in recommended doses and for less than 2 months at a time. Akhondzadeh S, Naghavi HR, Vazirian M, Shayeganpour A, Rashidi H, Khani M. Passionflower in the treatment of generalized anxiety: a pilot double-blind randomized controlled trial with oxazepam. J Clin Pharm Ther. 2001;26:369-373. Akhondzadeh S. Passionflower in the treatment of opiates withdrawal: a double-blind randomized controlled trial. J Clin Pharm Ther. 2001;26:369-373. Barbosa PR, Valvassori SS, Bordignon CL Jr, et al. The aqueous extracts of Passiflora alata and Passiflora edulis reduce anxiety-related behaviors without affecting memory process in rats. J Med Food. 2008;11:282-288. Blumenthal M, Goldberg A, Brinckmann J. Herbal Medicine: Expanded Commission E Monographs. Newton, MA: Integrative Medicine Communications; 2000:293-296. Dhawan K, Kumar S, Sharma A. Anxiolytic activity of aerial and underground parts of Passifloraincarnata. Fitoterapia. 2001;72:922-926. Elsas SM, Rossi DJ, Raber J, et al. Passionflora incarnata L. (Passionflower) extracts elicit GABA currents in hippocampal neurons in vitro, and show anxiogenic and anticonvulsant effects in vivo, varying with extraction method. Phytomedicine. 2010;17:940-949. Ernst E, ed. Passionflower. The Desktop Guide to Complementary and Alternative Medicine. Edinburgh: Mosby; 2001:140-141. Grundmann O, Wang J, McGregor GP, Butterweck V. Anxiolytic Activity of a Phytochemically Characterized Passiflora incarnata Extract is Mediated via the GABAergic System. Planta Med. 2008;74:1769-1773. Jawna-Zboinska K, Blecharz-Klin K, Joniec-Maciejak I, et al. Passiflora incarnata L. Improves Spatial Memory, Reduces Stress, and Affects Neurotransmission in Rats. Phytother Res. 2016;30(5):781-789. Larzelere MM, Wiseman P. Anxiety, depression, and insomnia. Prim Care. 2002;29:339-360, vii. Review. Miyasaka L, Atallah A, Soares B. Passiflora for anxiety disorder. Cochrane Database Syst Rev. 2007;(1):CD004518. Modabbernia A, Akhondzadeh S. Saffron, passionflower, valerian, and sage for mental health. Psychiatr Clin North Am. 2013;36(1):85-91. Movafegh A, Alizadeh R, Hajimohamadi F, Esfehani F, Nejatfar M. Preoperative oral Passiflora incarnata reduces anxiety in ambulatory surgery patients: a double-blind, placebo-controlled study. Anesth Analg. 2008;106:1728-1732. Rotblatt M, Ziment I. Evidence-Based Herbal Medicine. Philadelphia, PA: Hanley & Belfus, Inc; 2002;294-297. Sarris J. Herbal medicines in the treatment of psychiatric disorders: a systematic review. Phytother Res. 2007;21:703-716. Review. Watson RR, Zibadi S, Rafatpanah H, et al. Oral administration of the purple passion fruit peel extract reduces wheeze and cough and improves shortness of breath in adults with asthma. Nutr Res. 2008;28:166-171.